So, there was this kid who grew up in the wilds of Etobicoke who looked to the distant pastures of the Big City, known as Toronto (or Torrona to some) and, gradually, he became resentful that Torrona had so much to offer while Etobicoke was … well, just an inconsequential municipal appendage of sterile subdivision after sterile subdivision where sparrows and starlings cohabited with the residents; where the highways ran out of town to the rest of Canada and the big, wide world. So Doug, for that was his name (Duggie to his close friends) vowed that, when he grew up. he would take on the world – especially Torrona. Which he did, becoming the leader of the provincial Conservative Party, then the first Conservative Premier of the country’s largest province since Ernie Eaves in 2003, as he watched the then governing Liberals implode and self-destruct, leaving the political world resembling a moonscape for Duggie to reshape. And why not, for the province needed work. Housing concerns to face, power problems, poverty. But, in a stroke of brilliance, one of Ford’s first pronouncements was – are you ready for this? – to make the Cormorant extinct in the province of Ontario! Yes, The Cormorant. Phalacroraxcarbo if he’s interested; a beautiful, graceful bird that minds its own business skimming the lakes and rivers of the province while Ford figures out how to run a government. ‘Tis mind-boggling. Hunters would be allowed to kill up to 14,000 birds in a season! Why and where from would a provincial Premier dream up such an outlandish, revolting idea? Was it a slow day in the Premier’s office? Too many awkward questions during Question Period? The drive home too long late at night? One of the great pleasures of living in this province is being able to go east on Lake Ontario to the Thousand Islands where a wildlife wonderment awaits, depending on the time of year. 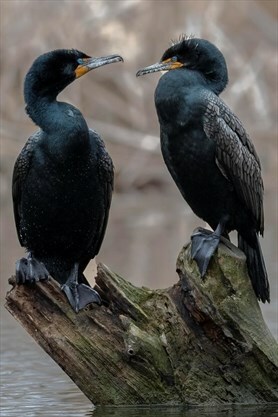 Marine and regular species of all kinds head there during the breeding season making it one of Ontario’s premier wildlife attractions – including, if you’re lucky, a Cormorant. And you don’t have to go that far; sitting at Monk’s Cove on most days, one can spot the Cormorants skimming the water heading somewhere. And Doug Ford wants to allow ‘hunters’ (as if they hunt) free reign to slaughter as many of the birds they can. Yes, I’m one of those that find hunting abhorrent. I don’t understand the mentality of a person who can kill for ‘fun’. In distant times when there were no supermarkets to purchase chickens, turkeys, ducks, and food had to be hunted in order to survive, then hunting was a necessary way-of-life. So, I hope the hunters of this world will …. I was going to say, ‘think about the beauty and grace of a Cormorant and don’t pull the trigger.’ in that one-sided moment between life and death. But I know better. Some males of the species have to assert their status and their ‘manliness’ through guns and hunting; killing. Which is very, very sad. Most supermarkets have chicken, duck, turkey for sale; different flavours. Why not be content with that. Oh, of course, if it wasn’t hunted, it doesn’t taste right. Then again …. maybe they do have Cormorants in Etobicoke, even occasionally in Doug Ford’s garden. Maybe they make too much noise and after a day running the province, too much Cormorant noise is all that he can take. Perhaps he’s never even seen a Cormorant. Which would be too bad. He’s missed a beautiful sight. Good writeup, Graham, but I take issue with the ” free reign” comment. “Reign” is what Her Majesty, Queen Elizabeth II does as Queen of Canada. I suspect you mean “free rein”. Grocery store meat is treated much much worse than hunted meat. Those animals live a tortured life ending in death all so people can have a yummy taste in their mouth. At least a hunted animal lived a normal life up until that point. Meat eating in general will see its day of reckoning. I sense that the save the cormorant team has never witnessed first hand the damage these birds cause forested shoreline areas. Like how how they relentlessly destroyed Tommy Thomson park on Toronto’s Leslie Street Spit. They have also destroyed the shoreline on part of the Toronto Islands. These birds have grown in number to the point where they have taken over Lake Ontario. For the first time in my lifetime I see the cormorants have invaded the Kawartha and Haliburton lakes. Once they start nesting there and destroying the shorelines there will be a lot of angry residents on those lakes. This is a big deal and I congratulate the province on recognizing it as such. Humans have destroyed a lot more than some Cormorants ever will. Could the Town pass a by-law protecting the cormorants? Sure, let them nest in the trees on your property. Or maybe Graham’s or Walter’s. I was not aware of this and find it appalling! Shades of the passenger pigeon slaughter or maybe that scene in Fried Green Tomatoes where the father keeps trying to shoot all the starlings. Linda – Miriam, what would be your course of action if you found several rats in your basement? What would you do if a family of red squirrels or raccoons set up home in your attic? Some years ago, my two cats took to sitting on my house roof and taunting the two dogs who lived next door by watching them in veiled silence as only a cat can do. That kept some of the wildlife at a distance for a time. To answer your question more directly Frenchy, if personal safety and damage is involved I would discourage the critters from staying around and encourage them to move on. For example, fixing a hole in the roof. And as many will know, killing or removing a wild creature like a squirrel typically means another will soon take its place. Great article. Very well written. You do this community justice. The cormorant problem is not just a product of ‘Duggie’s’ fevered imagination, but it is a world-wide issue. Good article. It positions the birds in context of some real issues. Seems it is easier to cull the birds so that there are more fish for anglers than deal with the major issues affecting fish and fish health in Wales … agricultural pollution, sewage pollution and habitat destruction. These are identified by the official being interviewed.. It is interesting to note, Miriam, that the cormorant was the poster bird for the returning health of the Great Lakes. Where there are many cormorants, there are many fish. Did they happen to mention what the other 98% was made up of? I call BS on that 2% figure. Don’t believe everything you read in an opinion piece in a newspaper. The closest I could find to a Canadian Wildlife Services report was this 20 year old report showing 44% of their diet (outside of smolt runs) was commercial and recreational fishes in North Eastern North America. That’s great Walter, I hope they build a nice comfortable nest in your favourite tree in your backyard. If you happen to have a fish pond back there, better get a dome for it. You’re a big “Google” guy, try finding a report that backs up the claim of only 2%. Perhaps you should get to know some hunters, instead of looking down your opinionated nose at them. A large chunk of hunters are conservationalists and quite responsible. I wonder who you would blame as well when animal populations got out of control and led to starvation and disease. The Ministry allows hunting licenses as per what they deem an acceptable amount to control such things. Painting everyone with the same brush has never proved to be a smart choice, so instead of taking out your frustrations with Ford on an entire group, perhaps you should actually chat with some of them. Oh, and as for your whole grocery store comment, big farms that stock those stores have worse reputations than hunters for cruelty. When you sail down Lake Ontario from Toronto to Kingston it is easy to spot cormorant nesting grounds. All the trees and surrounding vegetation is dead and the area stinks. Frenchy’s link below to Tommy Thomson park damage is an example of this. When you motor through the Eastern Gap between Ward’s Island and The Portlands you can see the huge swaths of decimated trees and vegetation and you have to hold your nose if the wind is from the east. Boaters never used to see cormorants on Lake Ontario. Now there are 1,000’s of them everywhere. If they tasted good they might not be such a problem. The smell is likely from the nearby Ashbridges Bay Wastewater plant….also more habitat destruction caused by said plant than the cormorants. Maybe they could be encouraged to nest in Victoria Park so we could all get a better chance of observing them. Look what a nice job they did at Tommy Thompson park in Toronto. Maybe not so much a Cobourg issue but definitely within our sphere of influence as citizens and taxpayers. That would be 50 birds a day for each hunter. It is expected that hunters would dispose of the dead bodies appropriately but there appears nothing to deter them from leaving the carcasses to rot where they fall. The justification according to government sources is concern expressed by commercial fishing industry and property owners. The cormorant is a native bird species … so where are the natural predators and what have humans done to mess up that natural system of checks and balances e.g. encroachment? Commenting on the proposed legislation closed January 3. One of the big issues expected to be raised against the proposal is that hunting will occur over the summer months (March to December inclusive). Somehow I see the idea of a summer time mass kill to reflect poorly upon the Ministry in charge of protecting provincial parks and natural areas visited by the general public. Hunters I know are responsible people. It is the chance of damage inflicted by others less disciplined that is a concern.